Generally, when people think about Easter, they think of eggs hunts, candy, and sometimes sneaky bunnies. 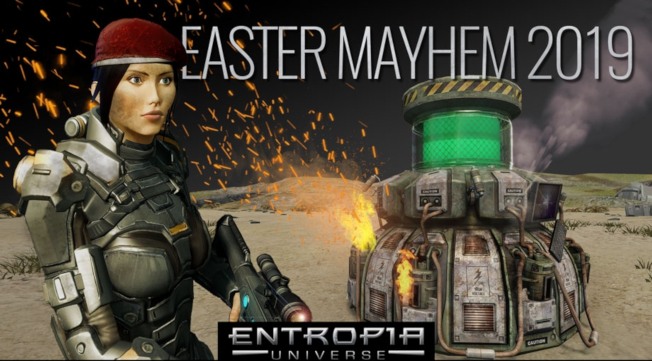 Apparently, this is not the case in Entropia Universe, where Easter seems to come with battling evil robots. During the Easter Mayhem Event, players can join the Calypso Defense Force to fight legions of robots and protect the Data Interceptors. We’re not talking one kind of evil robot either. Players will take on Eviscerators, Spider Bombers, Defenders, Warlocks, and even Warrior robots. In exchange for their service, players will be rewarded Mayhem Tokens, which can later be traded for exclusive event items. Full details on how to enlist in the Calypso Defence Force and participate in the event are available on the Entropia Universe site.